There are two things to note when installing a new crank sensor. First, the blades on the back of the damper pass thru the the slot on the sensor that is opposite the side with the connector. Secondly, all three blades on the damper must pass cleanly thru the slot without rubbing at any point. Be sure you check ALL three. Turn the balancer via a 28 mm socket on the bolt head until satisfied that clearances are correct. A sensor that rubs can/will cause poor performance. Following are instructions for R & R as provided by Ed Baker. 2. Slowly rotate the engine until any window (slot) in the reluctor wheel on the balancer is aligned with the sensor. 3. Loosen the pinch bolt on the sensor pedestal until the sensor can freely slide in the pedestal. 4. Remove the pedestal to engine mounting bolts. 5. 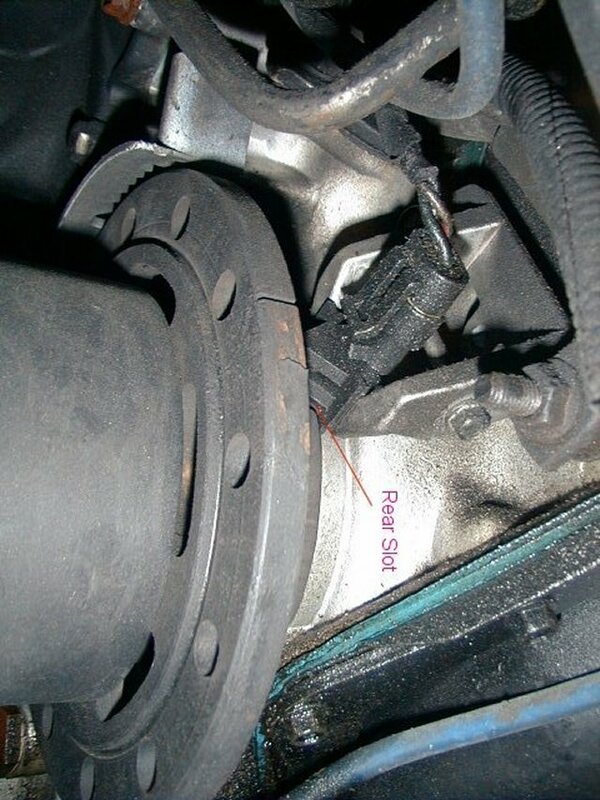 Carefully remove the pedestal and sensor as an assembly from the engine. The sensor will move in the pedestal and care must be used when removing. 6. Before installing the new sensor, Loosen the new sensor in the pedestal until it can be moved freely. If sensor is purchased as a complete unit with pedestal, loosen before installing. 7. Verify that the reluctor is still in alignment and install the pedestal and sensor on the engine. 8. Tighten the pedestal mounting bolts to 22 ft. lbs. 9. Adjust the sensor when finished. 1. With the sensor installed on the engine. Insert tool (see tool info below) into the gap between the sensor and the reluctor on the balancer. 2. Make sure that the interrupter (reluctor blade on pictures above) is sandwiched between the blades of the adjustment tool and both blades are properly inserted into the sensor slot. 3. Tighten the sensor pinch bolt to 30 inch lbs. while maintaining light pressure on the sensor and interrupter ring. The air gap clearance is .025 on both sides of the sensor. Many household items can be used as a nonmagnetic tool. I like to use the black plastic on the bottom of 1 litter soda bottles. Also some of the temp. throwaway credit cards you get in the mail are also .025 and work well. 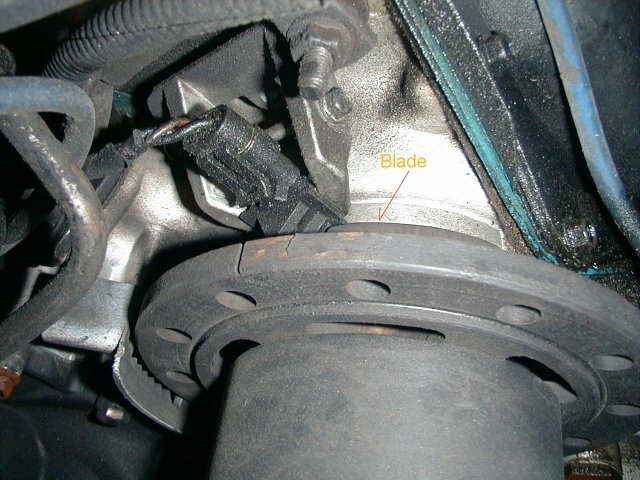 Check all three reluctor interupters (blades) before starting car.